Are you tired of regular visits to the parlor for waxing, threading, plucking, and shaving? Would you like to have a permanent solution for this? Laser hair removal technique is here for your rescue. Removal of unwanted body hair can be a very inconvenient and time taking process. Why inconvenient? Because tweezing is painful, razor can give you razor burns and waxing is again quite painful as and you may have to deal with skin allergies sometimes if you have a sensitive skin. Body hair removal is not only a matter of concern for women but men as well. The most common areas for hair removal in women include face, neck, arms, underarms, stomach, bikini area and legs. While in men the most common treatment areas are face (beard shaping), chest, shoulders, arms, stomach and legs. Laser hair reduction is one of the most predictable processes - it turns out to be successful in a majority of the cases. However, some precautions need to be taken both prior to and post the treatment. It is recommended that no plucking or waxing of hair is done at least 6 weeks prior to the treatment. These procedures temporarily remove the hair follicles and hence become unaffected by laser rays for as long as a month and a half. Also, it is better to avoid facing the sun for a few weeks before and after the laser treatment. Laser removing clinic in Surat also suggests that you take anything between 4-6 sittings over a gap of 3-4 weeks for achieving optimum results. The place where the treatment will be performed. Any permanent damage to the skin through laser treatment for hair removal is quite rare. Usually, the skin appears to be sunburned for a few days and then goes back to looking normal. Sometimes blisters may also appear, especially in case of people with dark skin. Usually, patients feel a little discomfort, rashes, redness or irritation in the treated area after the treatment. An ice pack or cooling cream or gel is usually recommended to take care of this situation. Laser hair removal is the safest, most effective, quick, outpatient procedure, which uses powerful laser energy to prevent hair growth. For the vast majority of people the answer is YES! Laser can treat women and men of all ethnicities and skin types. Lasers are attracted to the pigment of the hair, so if you have white or light blonde hair colour, then the hair cannot be treated. Laser hair removal is the process of laser beaming highly-concentrated light into the hair follicles. Pigments in the follicles absorb the light and heat up to the point of singeing, which then destroys the hair and the surrounding root disabling it from future hair growth. DOES HAIR REMOVAL REQUIRE MULTIPLE TREATMENTS? Yes! Because hair grows in cycles, several sessions are necessary in order to treat all of it on the given area. Treatments are scheduled based on the average length of the patient’s hair growth cycles, usually once every 4-6 weeks. The face usually has a shorter treatment cycle and therefore more frequent treatments (about 4-6weeks apart) whereas legs and back need less frequent treatments (closer to 8-10 weeks apart). HOW LONG DOES EACH TREATMENT SESSION TAKE? Small areas such as the upper lip can be treated in 3-5 minutes, and larger areas such as the back or full legs, may take up to an hour or so. HOW DO I PREPARE FOR LASER HAIR REMOVAL TREATMENT? Stop plucking, waxing for 6 weeks before the treatment. The lasers target the roots of the hair, which are temporarily removed by waxing or plucking thereby rendering the treatment ineffective. Generally, laser hair removal is far less painful than waxing, though the sensation is different. Most people do not require any anesthetic cream to be applied to the affected area before the treatment starts. However, the doctor prescribes one for patients with sensitive skin. ARE THERE ANY RISKS OR SIDE EFFECTS INVOLVED? Temporary itching, swelling and redness for 3 days can be experienced. If proper care is not taken after the treatment then temporary pigmentation/scab may also occur. WHAT is POST LASER TREATMENT CARE LIKE? For a day or two, the treated area of your skin will look and feel like it’s sun burned. Cool compresses and moisturisers can help. The treated hair will fall out. So, wear sunscreen always to help prevent temporary changes in the colour of the treated skin. WHAT IF I HAVE EXCESSIVE HAIR GROWTH? A majority of patients have achieved outstanding results from laser hair removal treatment. But, in cases of excessive hair growth – the patient must find out if there’s any possible underlying medical condition behind it or not. For instance, men experience excessive growth in case of high blood sugar levels and women sometimes are born with male-pattern facial hair or diagnosed with thyroid, hormonal imbalances, menopause etc. People with excessive hair growth must first talk it out with the doctor and understand the factor responsible for the problem before choosing laser hair removal treatment as a permanent solution. Yes! Waxing, plucking or shaving are all temporary solutions. 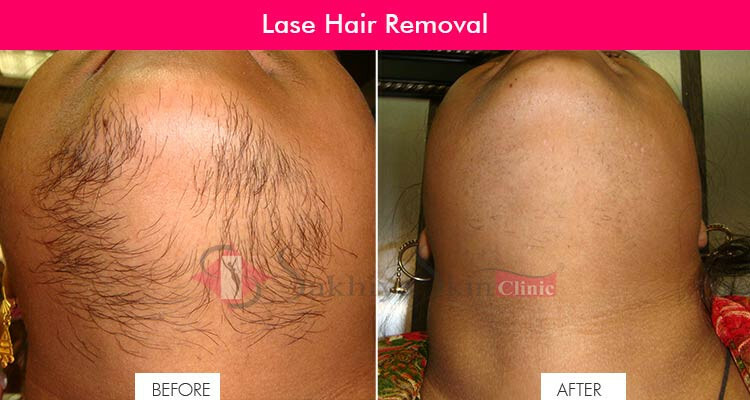 FDA approved laser is a long lasting solution to treat unwanted body hair. More the number of sessions greater is the degree of long lasting hair reduction. I HAVE IN-GROWN HAIR ON MY FACE, LEGS, BIKINI AREA AND BACK. WOULD LASER HELP? Absolutely! Even after one treatment you will notice that most of your ingrown hair will vanish. WHICH AREAS OF BODY CAN I CHOOSE FOR LASER HAIR REMOVAL? Any area, precisely. For females – face, upper lips, chin, neck, underarms, bikini line, legs, hands. For men - beard, back, chest, abdomen, hands or legs.